All food consumed by humans can be divided into three major groups: proteins, fats and carbohydrates. Carbohydrates are basically sugars and starch. Low-carbohydrate diets restrict the amount of calories you would get from these foods. You would not have to cut all of them out completely, but you would consume less than you would on another type of diet. The amount of protein and fat consumed on a low-carb diet will probably be higher than that on a standard diet. Read more about carb content of common foods. 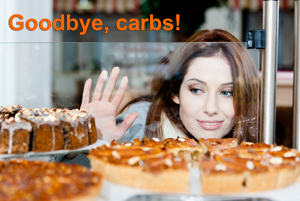 Carbohydrates are usually processed by your body as a source of energy, and can also get stored as fat if not used up. Restricting carbohydrates consumption makes your body switch into a different metabolic state called ketosis, where your body starts using up fat for energy. There is also an additional metabolic advantage, as your body needs to use up extra calories to process high amounts of protein. Finally, eating a lot of protein helps you feel full for longer, thus making it easy to consume fewer calories overall. Is a low-carb diet right for me? What are the benefits of low-carb diets? First of all, low-carb diets really do work. If you do it properly and stick your chosen diet plan, you will lose weight, and most likely will find it happening easier and faster than on a standard diet. You will not end up feeling hungry all the time, as can be the case on a low-fat or calorie-restricted diet. In addition, many people also report an improvement in their digestion, overall health and wellbeing. What are the dangers and pitfalls of low-carb diets? It has been claimed that low-carb diets can be dangerous for health, however, there is no solid evidence to back up this view (read more about this on our Low-Carb Diet Myths page). Low-carb diets have been around since 1970s (the original Dr Atkins diet), and enabled millions of people around the world to lose weight and actually improve their health. Providing you follow a proper low-carb diet plan, there should be no detrimental effect on your health, and you may even find some health advantages – some people have reported better digestion, lower cholesterol and reduction in allergies. If you suffer from any sort of medical condition, or are worried about health consequences for any reason whatsoever, please consult with your GP before staring a low-carb diet. If you are worried about getting the full spectrum of nutrients, you might also consider taking a multivitamin supplement. Are there any other disadvantages to a low-carb diet? You might find the diet a bit boring and monotonous, and will crave carbohydrate foods initially. However, cravings usually subside after several weeks on the diet. Read more about sticking to your diet. Your grocery bills will probably increase a bit, as protein-based foods such as meat and fish tend to be more expensive than carbohydrate-based food, such as bread and pasta. Finally, if you are a vegetarian, you might find it more difficult to follow a low-carb diet plan.